During one of our visits to Mayavaram we came across two Goddess Mariamman temples under Neem trees which were reported to be full of white and yellow coloured Neem leaves. First the news was unbelievable to us and therefore we decided to visit the temples out of curiosity. The Villagers called both the Mariammans as Vellai Veappilaikkaari, meaning Goddess Mariamman under Neem tree having white coloured Neem leaves. The first temple was on way to Tiruvaduthurai atheenam mutt in Mayiladuthurai-Aduthurai route, 17 kilometers from Mayavaram in a helmet called Mallarpet. Like banyan tree the Neem tree was giant in size with several branches spread on ground. 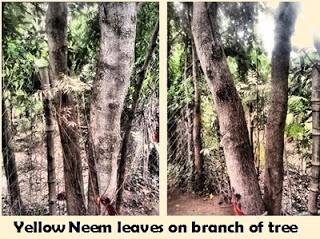 There was a small temple below the Neem tree. The Villagers called the Temple deity as ‘Vellai Veppilaikkaari’. We were told that the tree initially had green leaves on one side while the other side of the tree was full of milk white neem leaves. But the milk white neem leaves on the branches of the tree has dried up and the branches of the tree spread to the other side have grown into to a big tree without leaves. 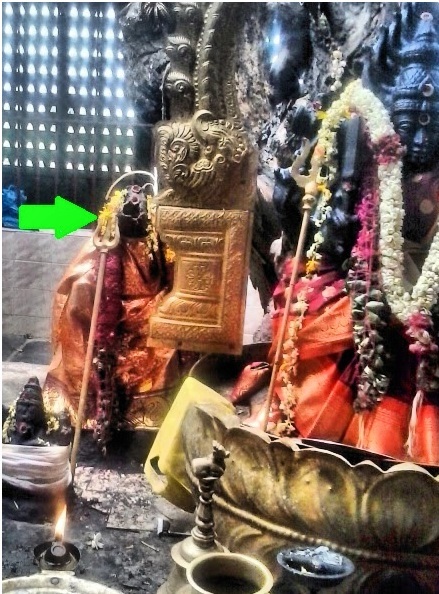 Under the new branch is seated Goddess Mariamman facing southern side. The dried branches have spread to ten feet over the ground, at the end of which it has grown into a big tree. Therefore to safeguard the branch from getting decayed a concrete floor has been erected over the branch on ground and Goddess Mariamman has been kept on the floor over a lotus shaped Peeda (carrier). Normally one may not see Goddess Mariamman enshrined facing south. Contrary to her appearance in ugraha form (anger mode) she is seen here in yoga mudran pose, facing south. The reason for the sober appearance is attributed to the visit of several Siddha Purush who were on penance in nearby forests and under this tree and every time they offered their prayers and worship to Goddess Mariamman who reportedly manifested there in the form of the neem tree an a small idol below, they appealed to her to remain in Yoga Mudran form to bless the visitors who would come there to offer prayers to her. As the time passed, the villagers began experiencing the grace of Goddess Mariamman manifested there especially in curing their diseases and blessing for an offspring. Therefore they constructed a temple below the neem tree and consecrated a statue of Goddess Mariamman displaying Yoga mudran pose and facing southern side. Those who fell sick when took one or two whitish leaves of the Neem tree and eat it, they were cured of their ailments. Those who prayed for an offspring were blessed accordingly. This belief led to several villagers began to pluck the leaves. Goddess Mariamman felt pain on her body when the leaves were plucked out as she was seated in the tree. 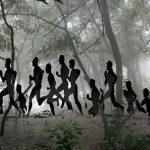 Therefore she shifted to nearby place and allowed the tree to dry so claim the villagers while expressing reason for the white portion of the Neem turning to lifeless branches. However at the request of the devotees, she again manifested there to bless her devotees in the form of a statue which is enshrined in the Temple constructed there under the tree. Childless couples still visit Goddess Mariamman under the same tree and worship her to beget children. The villagers claim that the Goddess Mariamman who is seated there is so powerful that those who sincerely offer worship to beget children have never been disappointed. 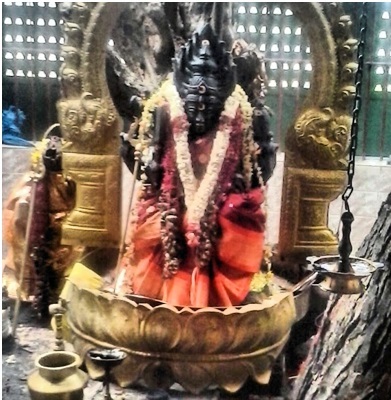 The branch of the tree too appears like a female deity with the features of Mariamman. As per the statement of Shri Veeramani, the pundit whom we met, the temple is as old as 2000 years. 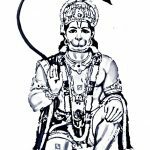 The tree is on the bank of a fairly big water Canal which was originally a river flowing thousands of years ago and Siddha Purush remained in penance on the banks of that unnamed river. The great sage Thirumular is said to be one amongst those who remained there in tapas for some time. 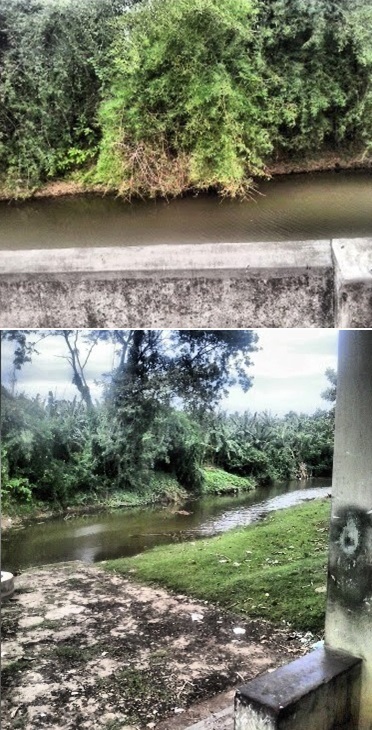 As time passed, due to natural calamities the river shifted to far off place and the present water canal is a small tributary of one of the sub rivers called Veera Sozhan. The temple has the photograph of the original Neem tree filled with white Neem leaves. We were told that the Goddess Mariamman here used to visit another place nearby, rest there for some time and comes back. The place where she used to take rest was near Thiruvalankadu, a small helmet on the highway between Mayavaram and Kumbakonam. When we visited that site too to see the temple, we were completely astonished and thrilled to see the Neem tree with full of white Neem leaves as fresh as milk in colour. Just ten feet away from the tree another Neem tree filled with full of yellow Neem leaves, as yellow as turmeric was also seen. The site of the second temple was inside a paddy field from the main road and one has to keep their conveyance on the main road and walk through a small lane covering a distance of say 100 feet. The Mariamman in this small shrine is also called ‘Vellai Veppilaikkaari’. The lore on this temple is that when the Neem leaves from the Neem tree in Mallarpet (where we went first) were plucked off quite often by those afflicted with diseases, the plucking of leaves caused enormous pain to Goddess Mariamman who stayed in the form of the Neem tree. When she cried to her younger sister narrating her ordeal, she consoled her and took her to her home in Thiruvalankadu, the second site and advised her to stay with her there. 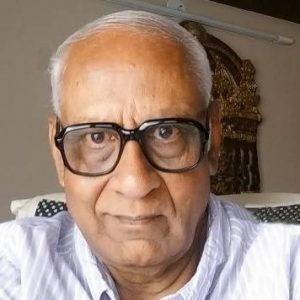 Therefore both the sisters stay there in the form of White and Yellow Neem leaves in the same place though the elder of them visit her original place too in Mallarpet to bless her devotees. The younger of them who stay under Neem tree with yellow leaves is called ‘Manjal Pavadaikkaari’ (Manjal denotes Yellow and Pavadai, the skirt). 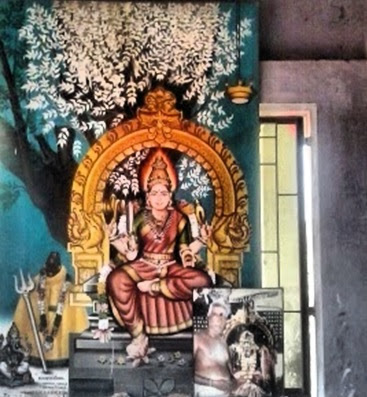 Savithri amma, a elderly lady who manages this temple site in her own land said that Goddess Mariamman appeared in her dream and asked for a small space to stay, indicating a particular spot in her land and next day the lady found a small Neem tree grown by the side of a small snake pit in the present temple site. God fearing villager, she had no hesitation in cleaning up the place around the tree and from then on began to worship the tree and the idol there. As the tree grew she found the leaves absolutely turned into milky whitish colour. In the next few days, to her surprise she found another Neem tree nearby having absolutely yellow leaves growing. Again Goddess Mariamman appeared in her dream and told her that the second Neem tree with yellow leaves was her younger sister who too is a deity and need to be worshipped along with her. The lady complied. A signboard appears on the main main road displaying ‘way to Vellai Veppilaikkaari temple’ to guide the visitors. There is a snake pit between the two trees. It is believed that both the sisters stay inside the pit in the form of five hooded Cobra. Savithri amma who owns the land quietly manages the temple without giving much publicity and those who come here after hearing the news on this temple offer their prayers there. Otherwise the entire Villagers are aware of this temple and offer regular prayers there. 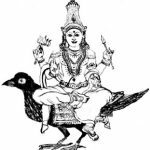 As I had written on many occasions, the Samayapuram Goddess Mariamman reportedly has big family and all of them are tutelary deities of Goddess Parvathi while Samayapuram Goddess Mariamman is the main deity in the family and manifestation of Goddess Parvathi. Goddess Mariammans in the non-agama temples are generally referred to as Ammans, while seated in in agama temples they are called Ambal. Therefore entire Goddess Mariammans are incarnations of Goddess Parvati only and those enshrined in the Village temples are referred to as Village Gods while in cities they are called Ammans and Ambal.